STORE WIDE SALE ON NOW! via JillysStuff on Zibbet – Jilly\’s Stuff. Fairy Tale Pincushion is Finished! 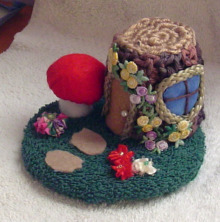 It’s finally done – My Fairy Tale Pincushion. I saw the picture in a book I got from the library and, with some alterations, made my own version. I had to crochet the stump and used old green toweling for the grass. 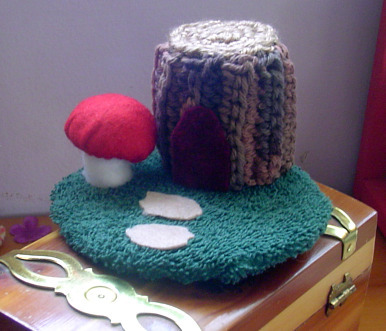 The toadstool, door and stones are felt and the window is yarn and some fabric I had. I made the flowers on the grass from ribbon and used appliques for the climbing vine. Around the door and window is part of a braided handle from an old gift bag. The base is 4.5″ round and the stump is 2.25″ tall and 1.75″ round. 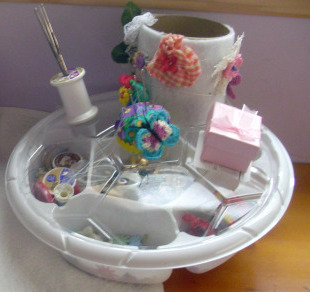 What fun I had and am now working on a Victorian Hat pincushion. Keep watching for the finished product. I’ve also been busy organizing some of my smaller items. I had a plastic fruit tray from the grocery store so decided it would be perfect to hold all of my little odds and ends that I use often. It has several deep compartments inside and I glued some other storage pieces on the domed lid. The butterfly pincushion I also made this past weekend. I used an old cardboard crochet thread cylinder to hold all my bits of lace and trim and glued some of my flowers around the outside. The thread bobbin holds my steel crochet hooks as I hate digging in the tube I use for my larger hooks. The little pink box will hold some small beads or charms I have hanging around. This sits neatly beside my chair in the livingroom and I have everything neat and handy. My hubby appreciates this as I can sometimes have a real “rat’s nest” of all manner of things dumped beside my chair. Now to go and work on my hat pin cushion. This should be very interesting. Crochet Madness – On a Roll Again! Finally all of the inspiration is flowing and I am back at my crafting again. I saw a picture of this fun Fairy Tale Pincushion in a book and just had to make one. There is a little burgundy door but it is too dark so I am going to cut out a brighter color. Still have some more embellishments to add then it is done. Keep watching for the finished one! I’ve had such a great time making this pincushion that I am going to make some more. I will make something using my smaller cross stitch pictures. I have a bunch that I don’t know what to do with so this project will be perfect.